Kent Valley, Lancaster CC, Lakes, Lune, Cleveleys RC and Barrow CW are running an inter club hilly competition for the first time in years. And the first one, a hill climb up Bigland Hill near Haverthwaite, is this Thursday 23rd April (it's the only event of the series on a Thursday evening, so the only one that clashes with our Thursday evening Salt Ayre time trials). The Club's Open SPOCO (Sporting Course) Time Trial took place this morning, Sunday 19th April, on the L211 course, from Caton up the south-east side of the Lune Valley to Kirkby Lonsdale, and back on the north-west side. Traffic lights due to road works at the railway bridge at Arkholme meant the usual 21.6 mile course had to be shortened to 14.8 miles. So today's riders had a less hilly route than previous years, but after battling a head wind out to the turn after 11 miles, were tail wind assisted for only the few miles to the finish. The winner by almost a minute, in 32:58, was Junior rider Adam Hartley of PH-MAS Cycling, with Henry King of Ilkley CC & Simon Bridge of Manchester Wheelers tieing for second place in 33:53. Lancaster CC riders' times: David Trotter 36:04 (11th); Thomas Brook 36:09 (12th); Stephen Gardner 40:13 (35th); Dave Horton 41:46 (40th). Full results are below. A lovely evening and a big field for week 7 of this season's Salt Ayre time trials. 12 riders at 2 miles, 24 at 6 miles, & 45 rides at 10 miles - 81 rides all up, which could be a record! A lot of decent rides at 2 miles, with Dylan Edwards just pipping Max Davies & Luke Oakes into 2nd and 3rd places (with times of 6:20, 6:28 & 6:39 respectively). Fastest girl was Nancye Robers in 6:56. Some good times posted at 6 miles too, with Tyrone Lewis fastest in 15:50, followed in 2nd place by fastest girl Evie Barrow, in 16:32. All up, there were nine +20 mph rides at this middle distance. At 10 miles a lot of riders are getting faster as the season progresses. Quickest this week, and the only rider under 22 minutes, was Andrew Horn in 21:57, followed by George Wharton in 22:19 & Fabian Brennan in 22:33. Amongst the women, Kerry Oldfield edged out Alison Oldham by two seconds, finishing in 27:26. Just to note that, whilst with so many riders on the track it's sometimes difficult to avoid, drafting other riders is technically against the rules and certainly something that's not to be encouraged; time trialling is a race against yourself, so please get your own time, not someone else's! Also, please keep to the left & overtake on the right, & when overtaking please leave space (less experienced riders are spooked by faster riders coming close to them). And finally, please don't forget to volunteer - these events can't happen if people don't lend a hand. Big thanks to all those who helped last night; once again, it was a lovely atmosphere track-side. 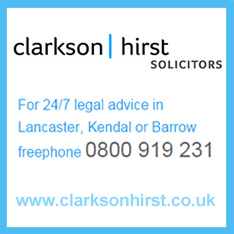 Late last year we were approached by Lancaster solicitors Clarkson Hirst, offering sponsorship! Only juniors are eligible for prizes at the shorter distances, and that’s two thirds of them! The Prize for Best Gauged ride is a PURE time trialling prize, but not one that could be awarded on a traditional out-and-back course— the steadiest, most consistent set of splits wins. It’s a fair bit of data crunching, but at least the timing system generates the data. The prizes for the second half of the season are similar, with the addition of prizes for those who improve most over the season. Finally, there’s a one-off prize of £150 for the first sub-20 minute ride - if anyone manages it! The first of this year's LCC Bank Holiday Monday 10 mile time trials on the Levens course took place on Easter Monday. Some very fast times were posted from the big field of 55 riders, with 27 sub-24 minute rides (averaging more than 25 mph). Michael Ellerton of Team Swift was quickest in 20:22, ten seconds ahead of Ryan Coulton. Lynn Hamel was the fastest woman, 16th overall in 22:35. 50 riders turned out for the fifth of this year's Thursday evening time trials on 2nd April. (Apologies for the delay in putting the results up here.) Fastest boy at 2 miles was Luke Oakes in 6:46; fastest girl Emilia Wood in 6:58. Sam Pugh was fastest over 6 miles, in 16:19. The 10 mile event was again very close - with Sam Monkhouse just pipping George Wharton, by 2 seconds, in a super-fast (in fact, the fastest time recorded on Salt Ayre so far this year) 22:22. Lynn Hamel rode at Salt Ayre for the first time this season, and was fastest lady, in 23:25. As always, click on 'Read more' below for the full results. Lancaster CC organises Club time trials on the L1015 course at Levens in south Cumbria on the four Bank Holiday Mondays during the road cycling season - the first is on Easter Monday, 6th April; the second, on May Day Bank Holiday Monday, 4th May; the third (which is also the Club Championship) on Whitsun Bank Holiday Monday, 25th May; and the fourth and final one on August Bank Holiday Monday, 31st August. All four events start at 8:30am. A cold & blustery but dry evening at Salt Ayre for the 4th of this season's weekly Thursday night time trials, with the same number of riders taking part as last week - 52 across the 3 distances. As always, it's great to see everyone, young and old alike, milling around trackside. The photo above is of Bob Muir, our timekeeper extraordinnaire posting people's finishing times (please note our recent call for volunteers to shadow Bob, & learn the timekeeping craft, so he becomes a bit less indispensable than he currently is!). Of the 6 riders at 2 miles fastest boy was Dylan Edwards in 6:52 and fastest girl Nancye Roberts in 7:58. Fastest of the 15 riders at 6 miles was Sam Pugh in 17:02. Fastest woman was Helen Bardsley in 21:10, and fastest girl Sasha Oldham in 22:02. With the winner of the first 3 10 mile time trials, Sam Monkhouse, resting ahead of this Sunday's Capenwray Road Race, Salt Ayre Cog Set Youth A rider George Wharton was fastest in a very quick - especially given the conditions - 23:03. Three other riders of the 31 participants rode an average speed faster than 25 mph to get under 24 minutes: Andrew Horn (23:26); Sean Casson (23:41); and Andy Barlow (23:51). Fastest woman was Kerry Oldfield in 30:27. With the clocks going forward this weekend next week's time trials will start, if not finish, in daylight. Please click on 'Read more' below, to access the full results. Following a very successful event last year, the Interclub 25 mile time trial is taking place again this year. The Clubs participating are Lancaster CC, Kent Valley RC, Lune RCC, Lakes Road Club, Barrow Central Wheelers & Cleveleys Road Club. The provisional date is Wednesday 8th July, with a reserve date of Wednesday 22nd July. Plans are also afoot to run a very simple Interclub Hilly series of time trials involving the same Clubs. It's proposed to award 30 points for the 1st placed rider, 29 points for 2nd, and so on (with only Interclub team riders gaining points), and the Club with the most points, no matter how many riders they have, wins the Interclub Hilly series. More details to follow, as & when we have them.